Item # 312970 Stash Points: 1,295 (?) This is the number of points you get in The Zumiez Stash for purchasing this item. Stash points are redeemable for exclusive rewards only available to Zumiez Stash members. To redeem your points check out the rewards catalog on thestash.zumiez.com. Add some neon vibes to your sock collection with the Chain Link Safety Green Crew Socks from 40s & Shorties. 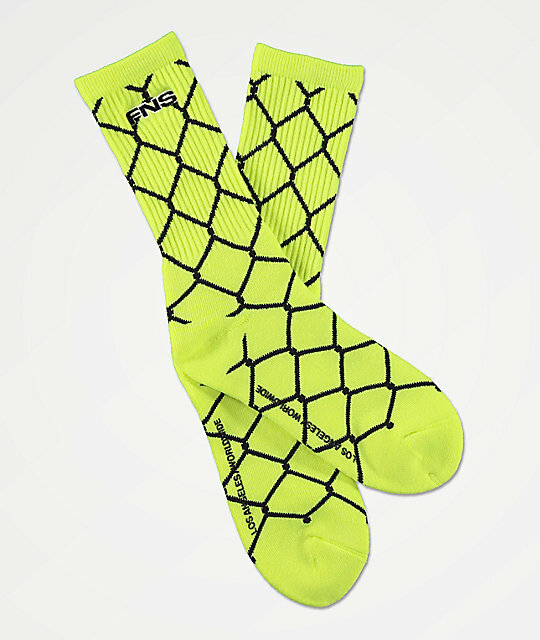 These vibrant crew-socks come in a safety green colorway and display jacquard knit chain-link pattern throughout. A "FNS" logo is embroidered at the ribbed upper cuff, and printed logos are found on each footbed, creating a must-have addition to your sock drawer. Chain Link Safety Green Crew Socks from 40s & Shorties. Crew height with an athletic ribbed upper. Jacquard knit neon green and black chain link pattern throughout. "FNS" logo graphic embroidered on the cuff. Printed logo graphic on the footbed. 66% cotton, 24% nylon, 8% polyester, 2% lycra.